The Xerox AltaLink B8090 Multifunction Printer will help your business produce work faster than before. The Xerox AltaLink B8090 MFP can print, scan, copy and fax. This copier allows you to create business designs that make your business stand out so that you’re clients enjoy the quality of work they are getting from you. The Xerox AltaLink B8090 Multifunction Printer produces up to 90 pages per minute, for printing color or black-and-white documents. There are extra features such as Mobile Printing, added security for personal documents, and additional finishing options, Finishing options help you produce higher quality results. There is also a mobile printing option, so if your clients email or text you files, it will be easier than ever to just send it straight to your copier from anywhere in your office. Xerox offers added security features and apps that ensure that you are only giving the people you want to see the files the access to them that they need. This will keep all of your files safe and secure. 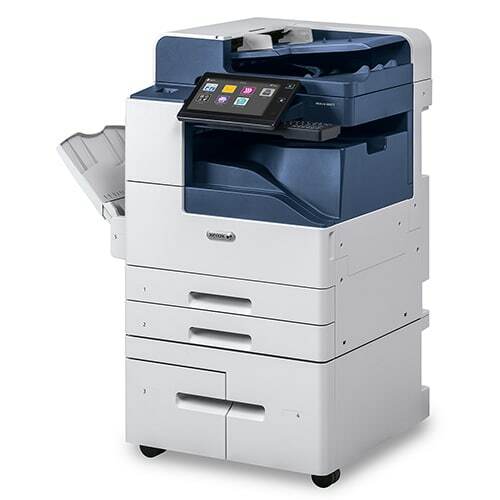 The Xerox AltaLink B8090 MFP is easy to install and use.You can use the equipment you already have in your office to install and start using right away. An installation wizard feature is included that walks you through the process so that it’s set up properly or a technician can come set it up in your office for you. Call us today and we will help you with any questions you may have on this copier or any other copier that Xerox has available.